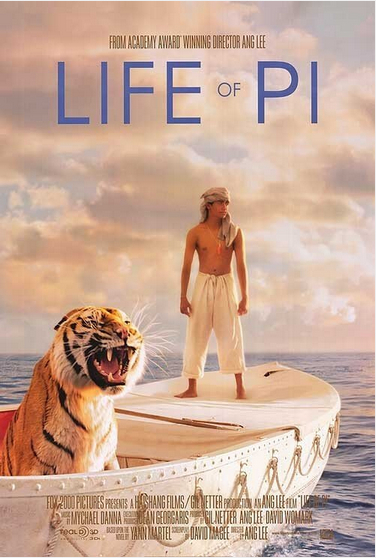 I’m hearing on good authority today that China’s 34th and final revenue sharing import of 2012 will be Ang Li’s 3D adventure Life of Pi. This comes as a surprise to us China film biz handicappers, because all 14 of the ‘enhanced’ film slots had already been spoken for; until today it seemed certain that the 34th slot would go to a 2D film. But according to one of my contacts at the MPAA, the 20 ‘non-enhanced’ slots can actually go to films of any format, so Life of Pi is in the clear..
A big strike against Life of Pi’s China prospects is that it will have a narrow window in which to release. The film goes out wide in the U.S. on November 21st, and since SARFT will impose another blackout on foreign films in December, the Ang Li picture will have to go pretty much day-and-date in China if it is to make any waves there. The film’s release will also be hampered by torrid competition from other imports, with The Bourne Legacy, Roland Emmerich’s 2012 3D re-release, Rise of the Guardians, Wreck-it Ralph, Twilight Breaking Dawn 1, and South Korea’s Deranged all expected to debut in late October and November (the distributors of all these films will be relieved that Resident Evil 5 will not be releasing). Throw in the Chinese blockbusters Taichi II and Feng Xiaogang’s Back to 1942 and you’ve got the makings of a wild and wooly November. Last week was a modest one at Chinese theaters, though one major milestone was reached as aggregate box office topped $2 billion for the year, more than 2 months earlier than it reached that mark in last year’s record-breaking run. Had it not been for SARFT’s numerous blackouts of foreign films China would have very likely topped $3 billion this year. Even so, aggregate box office will rise by at least 25 or 30 percent over 2011’s $2.06 billon, a growth rate that would have U.S. exhibitors drooling. The week’s big story was Bait 3D’s impressive $10.5 million blood-frenzy in its second week, nearly double Taken 2’s haul for the frame. The Australian 3D gore-fest has now surpassed Taken 2’s cume in China, and is on pace to land in the PRC’s top 20 grossers of the year. Safe to say that no one predicted Bait would be make such a splash, though in hindsight its success is consistent with China’s love of 3D, action and over-the-top stories. Total Recall scored a hefty $5.1 million in its first two days of release, further cementing China’s standing as the promised land for busted U.S. action and sci-fi spectacles. Other films that were rejected by U.S. and/or global audiences but embraced in China this year include Battleship, John Carter, The Mechanic, and Lockout. Two additional action films that performed well in China but fell short of very high expectations were Taichi 0, which will finish its run at around $25 million, and Looper, which should wind up at around $22 or $23 million. Foreign films will enjoy another month or so at the top of the box office before they are shoved aside for the benefit of local productions. In the mean time, look for the 2012 3D release to try and replicate Titanic 3D’s record-breaking run. This entry was posted in Box Office Reports, General News and tagged Ang Li, Bourne Legacy, Chinese import quota, Deranged, Life of Pi, Looper, Love is...Pajamas, revenue sharing, Rise of the Guardians, Rob Cain, Robert Cain, Taichi 0, Twilight Breaking Dawn, Wreck-it Ralph by chinafilmbiz. Bookmark the permalink.